Contact our PartyMojo office at 65696992 / Sales 81606655 / Yolanda 81606622 to enquire now! Drop us a quick email at [email protected] today for your very own waffles live station! Waffle Wednesdays? We’re offended! PartyMojo is all-day Waffles Everyday! PartyMojo launches our first ever Waffles Station, available for your wonderful event! Think cozy; think of all the comfy food you just want to indulge in. Warm, weightless, wondrous waffles – dreamy like breakfast in bed, soft and mushy on the inside, and the sweetness of the syrup dancing in your mouth… Wake up! It’s party time! But hey guess what? Take that comfort with you! Yes! Take it to your party with PartyMojo’s Waffles Station today! Waffles with maple syrup? Chocolate sauce doesn’t float your boat? Strawberry drips don’t tickle your fancy? We got this… Ice cream! Nobody says no to ice cream! 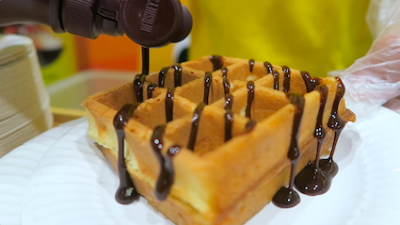 PartyMojo’s Waffles Station offers you warm waffles with all your favourite toppings, yes, that includes ice cream! If that’s not the dessert station you want to have at your event, we don’t know what is! We know you love all sorts of waffle spread and we love it too! PartyMojo offers a variety of sweet waffle spread to top your dessert fancy. First we have the good ol’ traditional maple syrup, precious golden drops for to make your day better. We also offer chocolate, because who doesn’t eat chocolate, right? Cocoa is the way to go! You know what they say, where there’s chocolate, there’s strawberry. Indeed, we wouldn’t dream of missing the chance to serve you with that rich, red berry on jam, now, would we? Is the Waffle Station Freeflow? How many servings can you serve in an hour? Yes, it’s absolutely free flow! We can cater to 40 – 50 servings in an hour. What’s required from me if I hire PartyMojo’s Waffle live station? Simply provide us with a table and a powerpoint and we’re good to go! Sometimes we’re all hot and cold, yes and no, in and out, up and down; we’re conflicted! But don’t feel too bad this time, because PartyMojo gives you the best odds to be at. 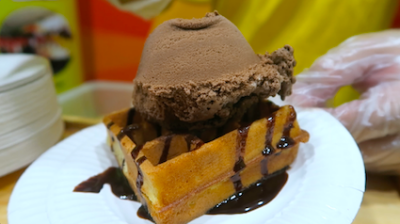 Wherever you are, whatever the weather, the time is now to have waffles with ice cream! We are psyched to include the ice cream option for our Waffles Ice Cream Live Station to serve you and your guests! Steamy waffles melting the ice cream, all finding ultimate peace in your mouth! Is the Ice Cream Waffle Station Freeflow? How many servings can you serve in an hour? What’s required from me if I hire PartyMojo’s Ice Cream Waffle live station? No problem! We can cater to as many people as you want in the hour. This can be done so by adding more stations and manpower! Simply call or email to enquire about your event details and you will get a quotation within a day! Waffles are just pancakes… with syrup traps! Wicked! If you’re the type to pander your sweet-tooth cravings with warmth and love, our answer for you would be waffles! PartyMojo brings hot, steamy waffles to your party for you and your precious guests to drown in all that waffle love! PartyMojo’s Waffles Live Station is just the item you want at your party. It’s mobile, spick and span, neat as a button and most importantly, serves just the dessert that goes right to your heart. Waffles station at your events! PartyMojo’s Waffles Live Station is the ultimate snack bar you’ve always wished for! Yes, we know your mind! It’s mobile and compact, accessible and ready for you, at any time! If your party is a little private affair, your guests would be delighted about the waffles! Its warmth would send your sincere thanks and love to them right to the heart! On the other hand, if you are holding a large-scale party like a corporate event, or a Residents’ party for RCs and CCs, why not have waffles too? Serving soft, mushy snacks with a variety of only the best sidekick spreads and ice cream to tens or hundreds of people is gonna get your party goin’ ! Top that with great hosting and entertainment, and be the talk of the town! To top a notch, PartyMojo offers machine-masking services for corporates’ branding and brand awareness. Now people can have your waffles and know your good brand, it doesn’t get any better than this! Our Waffles Live Station is user and serve-friendly. The only thing left for you to do is indulge in all the perfectness of the waffles with spreads, served hot! Our Waffles Live Station comes with one (1) manpower to man the station and serve you waffles with smiles! You can choose the topping that most tickles your fancy, and we’re good to go! Extra manpower can be requested, for crowd controlling purposes. This would be very helpful, especially for big events! Why Waffles Live Station at your private event / family day? Food finds its way to the heart. When it comes to spending good times with friends and family, you only want to have the best of what it takes! PartyMojo’s Live Waffles Station is great to have at your little fete because of the warm and comforting nature of the food itself! Enjoy the waffles with the many different spreads that we serve, not forgetting the ice cream, because life is perfect like that! Why Waffles Live Station at road shows / public event? If you’ve been tasked with planning or managing a roadshow, a corporate party, RC or CC events for residents, or any large-scale event for that matter, we know it’s a huge responsibility, but fret not, PartyMojo is here to help! We highly recommend our Waffles Live Station to be at your event. Our waffles are served fresh, served in an easy take away, and are made in a short time, so your tens and hundreds of guests will not wait too long! It is simply the perfect serve for your big event! What bester comfort food could your guests ask for, when there’s waffles? The warm, fluffy waffles will only turn smiles upside down! Have a great event when you have PartyMojo’s Waffles Live Station today! Some say waffles are pancakes with syrup traps, others think waffles are the gym-goer pancakes with abs! Whichever the case, waffles are as delightful as rainbows and butterflies! The highest consumption of waffles is in Belguim. There, they have dozens of waffle varieties, served sweet and savoury (manybe even tangy) and in different shapes and sizes! Typically, waffles are served as breakfast food, but since the love for waffles breaks the roof, people came out with “all-day breakfast”. We’ll be hoping for world peace next!